Scotland is home to a diverse and internationally successful higher education sector of 19 Scottish universities. Find out more about each one. Abertay University is world-leading in Computer Games education and has the UK’s first Centre of Excellence for Computer Games Education. Abertay University is conveniently located on a city centre campus in Dundee, with all of its buildings within a quarter of a mile of each other. Shops, recreational facilities and the main bus and train stations are just a short walk away. 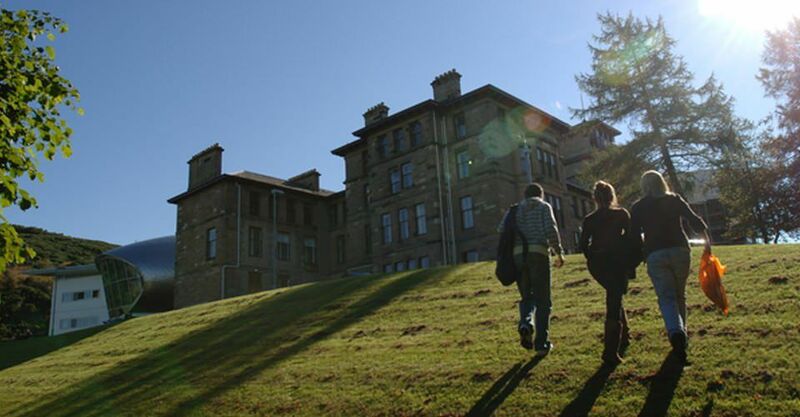 Around 5,000 students attend Abertay University with around 20% of students coming from outside of the UK. Of those, around a quarter come from countries outside of the EU, including India, China and Pakistan. The University’s teaching and learning has been judged to be of excellent quality in economics and environmental sciences and its research in psychology, environmental sciences, and law are recognised to be of world-class standard. Abertay was the first British university to offer undergraduate and postgraduate courses in computer games technology. The university has a state-of-the-art library and over 1,200 personal computers available for student use - one of the highest proportions in the world. 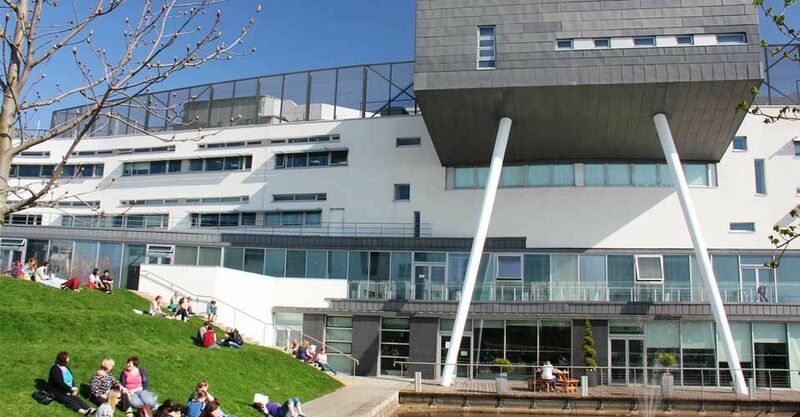 Edinburgh Napier University is a modern, professional and innovative university that places great emphasis on ensuring that its academic portfolio meets the needs of learners, employers and the economy. Times Higher Education ranks Edinburgh Napier in the top 5% of world universities. The Guardian Guide recently ranked it as the top UK modern university for Law. 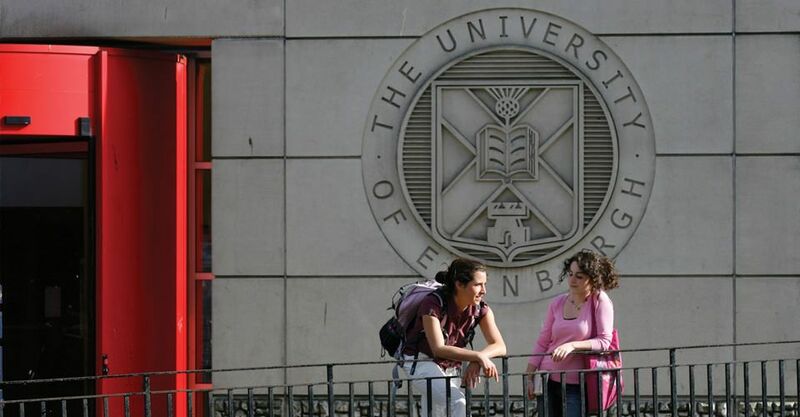 The university is based around its Merchiston, Craiglockhart and Sighthill campuses in Edinburgh, Scotland’s vibrant and cosmopolitan capital city. There are also smaller medical campuses outside the city in Melrose and Livingston. 15,000 students attend Edinburgh Napier University with over 4,000 international students from over 100 different countries. Employability is a key focus at Napier University, with over 95% of students securing jobs or further study within six months of graduating. Courses on offer include computing, life sciences, engineering, nursing and midwifery. The university is named after John Napier, the inventor of logarithms and the decimal point, who was born in 1550 in the medieval tower house of Merchiston Castle, Edinburgh. Glasgow Caledonian University has a reputation for applying its knowledge and skills for the social and economic benefit of the communities it serves in the UK and around the world. The university is located on a modern, award–winning campus in Glasgow’s city centre. 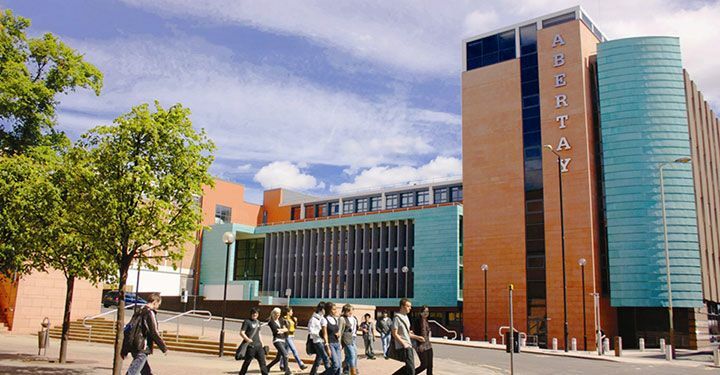 It also has a postgraduate campus in the UK’s capital, at GCU London. The student population of around 17,000 is drawn from more than 100 countries. GCU has established a reputation for careers-focused programmes and innovation through world-leading, impact-focused research in key fields including: health, the environment, banking, tourism and fashion. Many of the university’s courses are accredited by industry bodies. Its journalism programmes are accredited by the National Council for the Training of Journalists and the Broadcast Journalism Training Council. GCU London’s programmes are underpinned by industry support from market leaders including Santander, Morgan Stanley, AllSaints, and Marks and Spencer. Founded in 1845, the Glasgow School of Art is one of the UK’s few remaining independent art schools. The GSA has occupied its present site in the centre of Glasgow since 1899. At the heart of the campus is the renowned Mackintosh Building, designed by Charles Rennie Mackintosh, a GSA alumnus and one of modern history’s most influential designers. 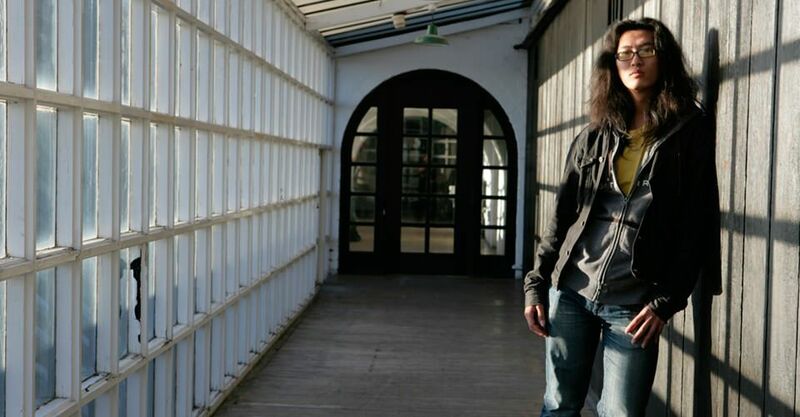 GSA has produced 5 Turner Prize winners, 3 Beck's Futures winners and all artists chosen to represent Scotland at the Venice Biennale since 2003. Glasgow School of Art has around 1900 students, welcoming international students from over 69 countries. The GSA is internationally recognised as one of Europe’s leading higher education institutions for the visual creative disciplines. Study is done through one of three schools: Fine Art, Design, and the Mackintosh School of Architecture. The focus of all courses is on studio practice. GSA students have the opportunity to work with practicing artists, designers and architects such as Louise Hopkins (Venice Biennale), Professor Thomas Joshua Cooper (Guggenheim Fellow), Brian Cairns (Gold Medal Winner from the Society of Illustrators), and Christine Borland (Turner Prize Nominee). In fact, 30% of the artists short-listed for the Turner Prize since 2005, including Karla Black and Martin Boyce, have been GSA graduates. The origins of Heriot-Watt University lie in the School of Arts of Edinburgh, which was established as the world’s first Mechanics Institute in 1821. 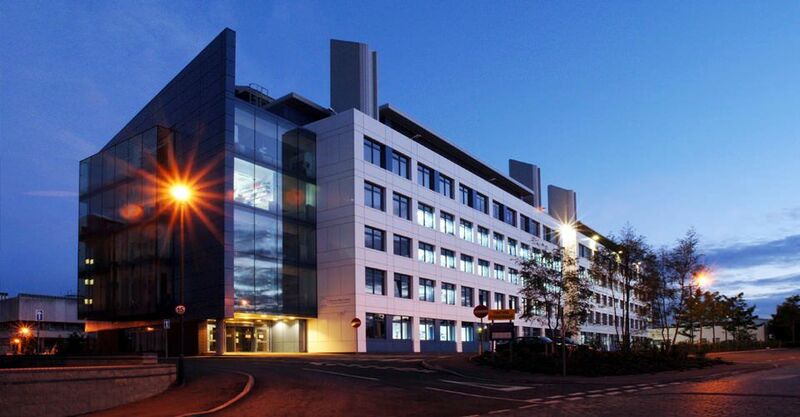 Based in Edinburgh, the university’s main campus incorporates a research park that is home to more than 40 companies. In 2005, the university opened its first international branch campus in Dubai, and more recently in Malaysia. The university has approximately 30,000 students, of which around 9000 are on campus in Scotland, over 3000 on campus in Dubai and the rest studying with partners or as independent learners globally. 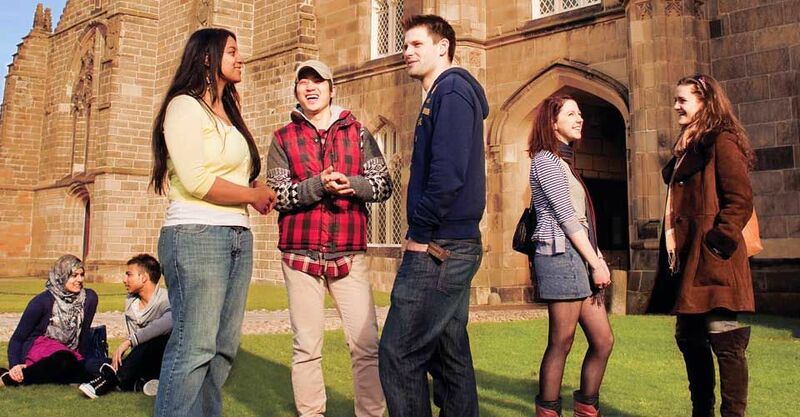 Heriot-Watt also delivers degree programmes to students in 150 countries around the world. 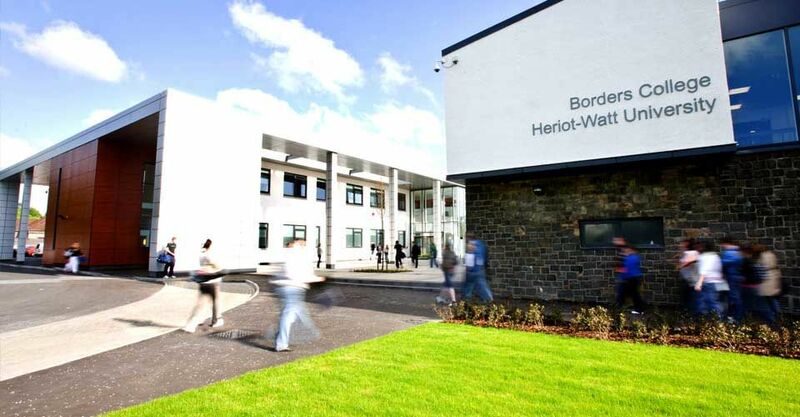 Heriot-Watt is renowned for innovation in science, engineering and business. It offers a wide variety of programmes from architectural engineering, robotics and cybertronics, and chemistry with forensic science, through to languages and intercultural studies, fashion technology and psychology (applied). As well as extensive international research collaborations, the university has 50 Approved Learning Partners – universities and colleges – offering Heriot-Watt degrees in 30 different countries worldwide. A major new campus in Putrajaya, Malaysia opened in 2014 offering high-quality, professionally orientated education, knowledge transfer and research. The Open University was founded to open up higher education to all, regardless of their circumstances or where they live. The OU is a world leader in modern distance learning, pioneering teaching and learning methods which enable people across the globe to achieve their career and life goals by studying at times and in places that suit them. There are 15,000 OU students based in Scotland and globally more than 250,000 people study with The Open University. The OU is one of the world’s largest MBA providers and it is one of only two universities in Scotland whose MBA is triple accredited. 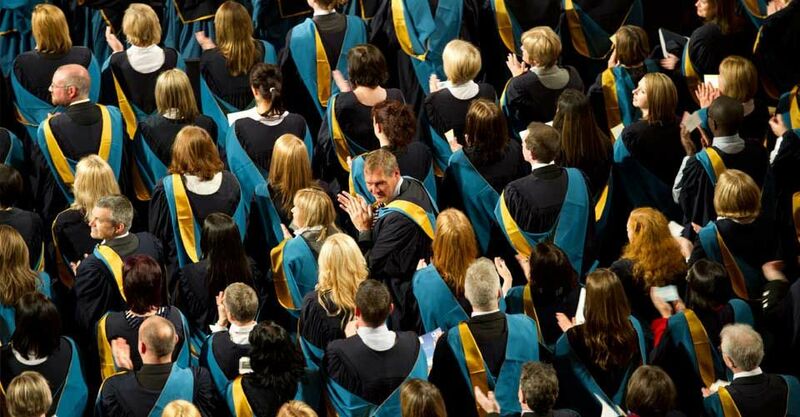 The OU in Scotland has topped the National Student Survey for satisfaction since 2006. The OU has helped many governments set up their own Open Universities, including India’s Indira Gandhi National Open University and Allama Iqbal Open University in Pakistan. The OU is also involved in a range of health and education development projects across Asia and Africa. Queen Margaret University was established in 1875 to address some of the key problems of its time such as better career opportunities for women. Today, it is a modern university where its teaching and research are designed to enhance the social and economic well-being of the communities it serves – within Scotland, the UK and internationally. Queen Margaret University (QMU) was established in 1875 to address some of the key problems of that time such as the need to provide better career opportunities for women. Today, it is a forward-looking university where its teaching and research are designed to enhance the social and economic wellbeing of the communities it serves – within Scotland, the UK and internationally. QMU is based at a purpose-built campus on the southeast side of Edinburgh, a vibrant and cosmopolitan city that is regularly recognised as one of the UK’s best places to live. The campus itself offers a bright, contemporary, student-focused community environment. The student population of QMU is more than 5,000, and around 25% of its students are international coming from more than 90 different countries. 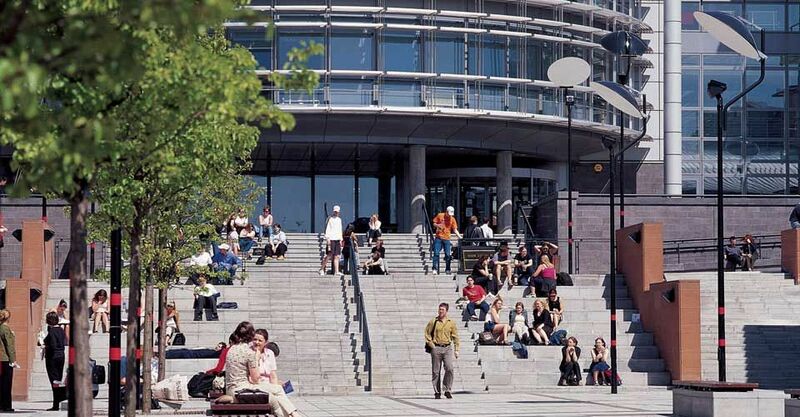 QMU has academic flagship areas of health and rehabilitation, sustainable business, and culture and creativity. The University provides highly relevant professional education and research that informs policy and practice in health, the creative industries and performing arts, media and social science, and business, enterprise and management. The University sets to provide the optimum balance of theoretical and practical education, and its success in this is reflected in its impressive graduate employability statistics. The University’s research and knowledge exchange centres work at the intersection of conventional disciplinary groupings to create innovative approaches to contemporary societal challenges and public discourse. QMU aims to be a university of ideas and influence, reflecting its focus on education and research that makes a real practical difference. Robert Gordon University was awarded university status in 1992 but has a pedigree in education that goes back 250 years. RGU has the best UK university for graduate employment according to the Higher Education Statistics Agency (HESA) and is recognised for delivering outstanding teaching and learning outcomes (TEF Gold Award, 2017). The university is situated in Aberdeen on Scotland’s north-east coast. It is a vibrant and multicultural city, home to a population of over 220,000, including 20,000 students. Robert Gordon University attracts more than 16,000 students from 132 countries every year. The university’s School of Pharmacy is the oldest in the UK and is recognised through affiliation by the World Health Organisation. Gray’s School of Art at RGU is over 125 years old and has a formidable reputation for producing some of Scotland’s top artists. The university also has a pedigree in health, engineering, business, the built environment and science. Over the last decade, the university has consistently had one of the best records of any UK university for graduate-level employment and was quoted in The Times Good University Guide as the best modern university in the UK. The Royal Conservatoire of Scotland, formerly the Royal Scottish Academy of Music and Drama, provides specialised vocational education to professional standards across dance, drama, music, film, and production. It is the only conservatoire in the UK, and one of few in the world, offering the full range of performance disciplines, the RCS is in the World Top 5 for Performing Arts Education. The Royal Conservatoire of Scotland has approximately 1,200 students of which around 30% of students come from outside the UK. Between them, they represent over 53 different nationalities. At the Conservatoire, students are industry-ready when they graduate. In fact, many have been engaged professionally before graduation. 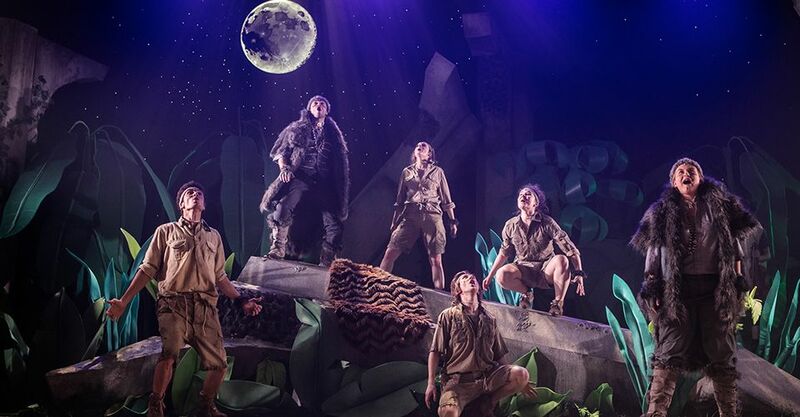 The Conservatoire has partners in industry including Scottish Ballet, Scottish Opera, BBC Scotland, National Theatre of Scotland, Royal Scottish National Orchestra, Shakespeare’s Globe, Royal Shakespeare Company, BBC Scottish Symphony Orchestra, and Classic FM. SRUC (formed by the merger of Scottish Agricultural College and Oatridge, Elmwood and Barony Colleges on 1st October 2012) is a specialist research, advisory and teaching institution that supports global agriculture and rural development. It is Scotland’s only land-based Higher Education Institution. SRUC has six campuses spread across Scotland - Aberdeen, Ayr, Oatridge, Elmwood, Barony and Edinburgh and has a student population of around 1500, working with international partners in over 40 countries. SRUC’s position as a Centre of Excellence has gained international recognition in the industries involved in food, land and the environmental sectors and all aspects of the rural economy. Courses offered range from vocational skills training to professional development. SRUC’s courses prepare students for the future. 95% of graduate are in employment or further study within 6 months. In fact, many companies approach SRUC first when seeking new employees. The University of Edinburgh is one the UK’s oldest and most prestigious, with an outstanding reputation for excellence in both research and teaching. It is a World Top 200 university. The University of Edinburgh has around 33,000 students with an international population of 11,000 coming from more than 140 countries. According to 2014's Research Excellence Framework (REF), the University of Edinburgh is a UK leader in medicine, veterinary medicine, computer science, linguistics and literature, and 83% of the University's research activity is classified as 'world leading' or 'internationally excellent'. University of Edinburgh scientists created Dolly the Sheep, the first mammal to be genetically cloned from an adult cell. The university is working towards many more historic firsts, including finding new treatments for diseases such as multiple sclerosis, motor neurone disease and breast cancer. The University of Aberdeen is the UK’s fifth oldest university with an academic reputation spanning over 500 years. Aberdeen is Scotland’s third largest city and Europe’s energy capital. Over 14,000 students attend the university in total; these students come from over 120 different countries from around the world. The university has an excellent reputation for teaching quality and research, and, over the years, five Nobel Prizes have been awarded for work carried out or begun at Aberdeen. The 2014 Research Excellence Framework (REF2014), the largest assessment of university research quality, rated 76% of the University's research as either ‘world-leading’ or ‘internationally excellent’. The university is ranked in the top 1% for teaching worldwide. The university has made a multi-million pound investment to provide its students with some of the very best facilities available anywhere in the UK. 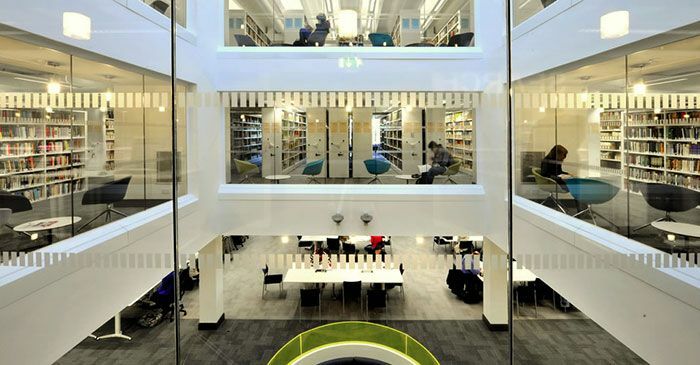 These include an Olympic standard sports village, one of the largest wireless campuses in Europe, a state-of-the-art medical teaching facility on Europe’s largest health campus and a £57m library. The university’s origins date back to 1881 when University College, Dundee, was founded. Dundee became an independent university in 1967 following a 70-year relationship with the University of St Andrews. Dundee University is one of the World's Top 200 universities and one of only 12 in the UK to also hold a Gold Award in the Teaching Excellence Framework 2017. Situated on the north bank of the Firth of Tay, Dundee is Scotland’s fourth largest city. It is currently undergoing a £300m waterfront re-development that will see the opening of the V&A gallery in 2018. 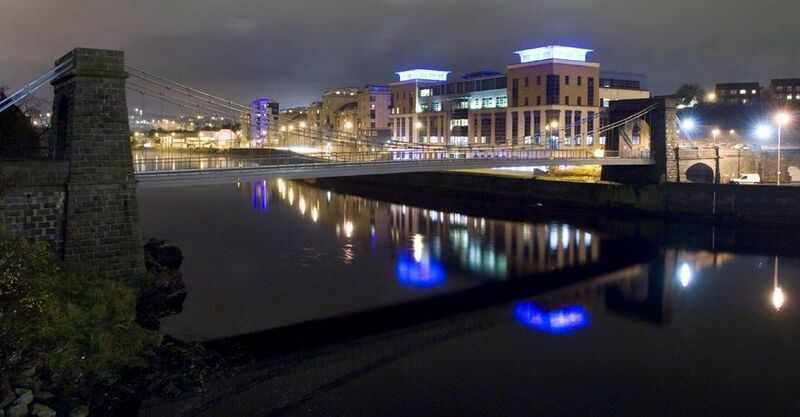 The university campus is just five minutes from the city centre. 18,000 attend the University of Dundee, where 145 countries are represented among the staff and students, and more than one quarter of the students are international. The University of Dundee attracts top-class researchers from across the world in subjects as diverse as medicine, life-sciences, dentistry, law, microelectronics, fine art and design, digital media and space exploration. According to 2014's Research Excellence Framework (REF), University of Dundee is the top UK university for biological sciences. Founded in 1451, the University of Glasgow is the fourth oldest university in the English-speaking world. It is one of the world’s top 100 universities, according to the QS World University Rankings, and a member of the prestigious Russell Group of leading UK research universities. According to the Times' Good University Guide 2018, University of Glasgow is the Scottish University of the Year. Glasgow is the UK’s third largest city – and Scotland’s largest – with a renowned music scene, excellent shopping, a wealth of arts and cultural venues, and friendly nightlife. University of Glasgow has around 25,000 students and the university welcomes international students from more than 120 countries. Research Excellence Framework (REF) 2014 concluded that clinical medicine at the University of Glasgow is 2nd in Scotland, and agriculture, veterinary and food science is ranked 3rd in the UK. 81% of the research carried out at the university is judged to be 'internationally excellent' or 'world leading'. The University of Glasgow has been associated with seven Nobel Prize winners, such as Professor Robert Edwards, awarded the Nobel Prize for Medicine in 2010 for his work on fertilisation. The University’s other high-achievers include the father of economics Adam Smith, founder of the absolute scale of temperature Lord Kelvin and the first female medical graduate in Scotland, Marion Gilchrist. Founded in 1413, St Andrews is the third oldest University in the English-speaking world and is ranked in the World Top 100 (QS World Rankings and Times Higher Education). St Andrews is a former royal burgh on the east coast of Fife. It is relatively small, with the University accounting for approximately half the town’s population. It has a distinctly cosmopolitan air thanks to the constant infusion of visitors who come to experience the spectacular scenery and famous golf courses. 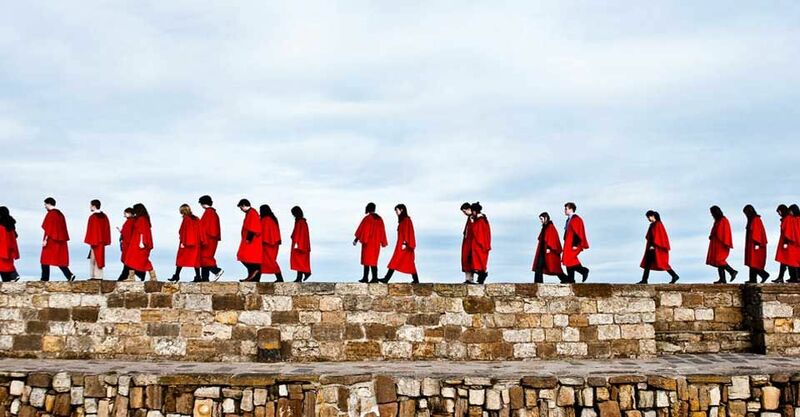 St Andrews has a student population of around 7,500 students with a third of the students from overseas. The University of St Andrews specialises in arts and the humanities but also has expertise in sciences and medicine. The university ranks in the top 10 for research, teaching and the student experience. One of its most distinguishing features is the strong sense of community reinforced by the size and location of the town and the many cultural and social activities on offer at the university. Two of the University’s most famous alumni are Prince William and Catherine Middleton who met while studying at St Andrews and shared a flat in the town. The couple returned to St Andrews in 2011, six years after graduating, to launch the University’s 600th anniversary fundraising appeal. The Prince said it felt like “coming home” and described his alma mater as “the best university in the world”. The University of Stirling is a leading UK teaching and research-intensive university, created by Royal Charter in 1967. Since its foundation, the University has embraced its role as an innovative, intellectual and cultural institution with a pioneering spirit and a passion for excellence in all that it does. The University is located in the city of Stirling; the gateway to the Scottish Highlands. The 330-acre campus encompasses a loch, a golf course and the 18th-century Airthrey Castle. 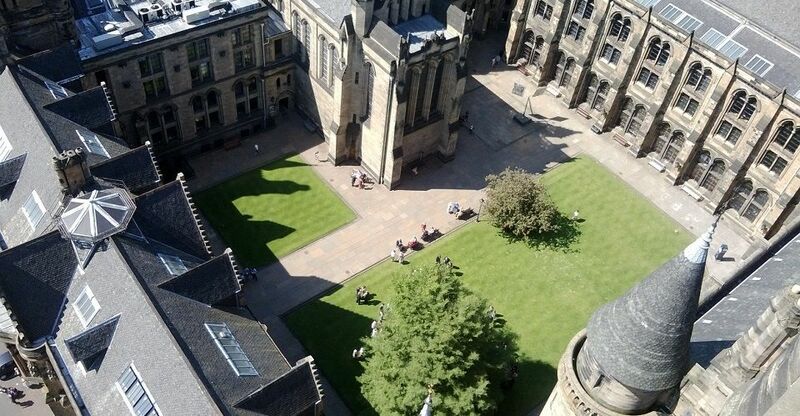 It is undoubtedly one of the most attractive campuses in Europe; ranked 1st in Scotland and the UK, in the International Student Barometer 2016. With more than 14,000 students and 120 nationalities represented on campus the University of Stirling is a truly global university and consistently tops the tables for student satisfaction in the International Student Barometer. The University of Stirling is a top-ranked Scottish university for nursing and midwifery; education; sports studies; communication, culture and media studies, and, according to the 2014 Research Excellence Framework (REF), three quarters of its research activity rated as either 'world leading' or 'internationally excellent'. The University of Stirling has been named Scotland's University for Sporting Excellence and has some of the finest sports facilities on a single site in Scotland. These include the Scottish National Swimming Academy, the Gannochy National Tennis Centre, a golf course and golf academy and facilities for all major indoor and outdoor sports. Established more than 200 years ago “for the good of mankind”, the University of Strathclyde has always had a global outlook. The university is ranked in the top five of UK universities for spinout and start-up companies in the PraxisUnico UK Survey. The university is situated in the heart of Glasgow – one of the UK’s largest, most dynamic and friendly cities. 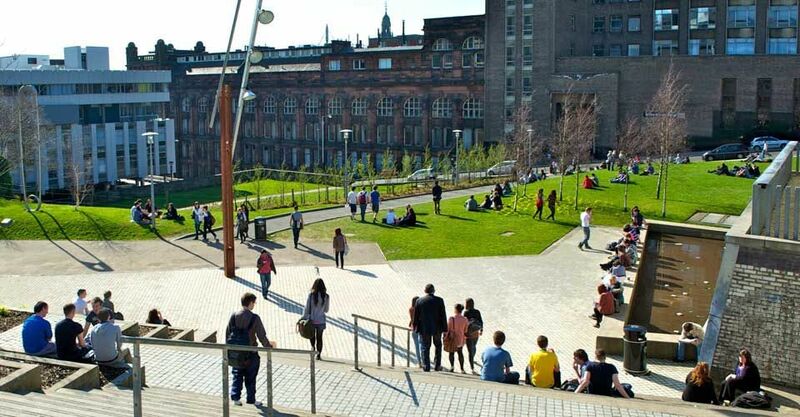 The University of Strathclyde has a student population of 22,000 representing 100 different countries. Strathclyde Business School is in the 1% of schools worldwide to hold triple accreditation from AACSB International, EQUIS and AMBA. The university is also internationally recognised for its close working relationship with global businesses, and its partnerships with industry, government and policy makers. Global partners include Babcock, GlaxoSmithKline, Rolls-Royce, EDF and Gamesa. The 2014 Research Excellence Framework (REF) results show that University of Strathclyde has strengths in science, engineering, business and the humanities. The Department of Physics is rated number one in the UK. 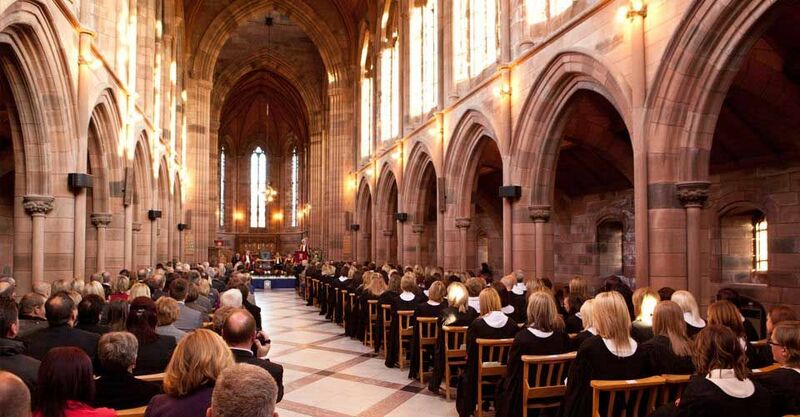 Formally established in 2011, the University of the Highlands and Islands is the newest Scottish university but it has been offering degrees since 1998. It includes institutions that date back over 100 years. The university has expertise in Marine Science, Renewable Energy, Archaeology and Adventure Tourism. Thirteen campuses and more than 70 learning centres spread throughout the Highlands and Islands make up the University of the Highlands and Islands network. 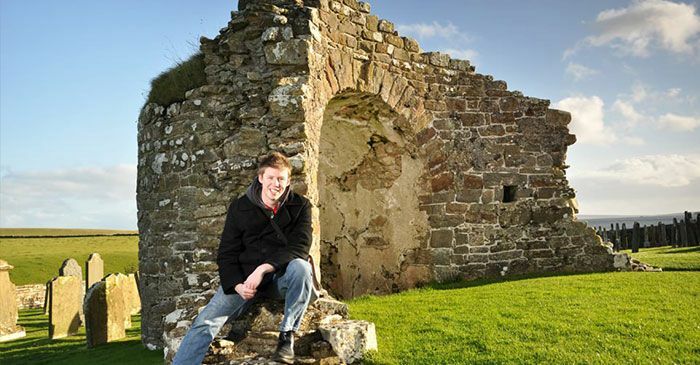 You might choose to study in one of the larger urban centres of the region, such as Perth, Inverness or Elgin, or in one of the smaller towns or island communities, including the Western and Northern Isles. The University of the Highlands and Islands has a student population of over 8,000 of which, around 3% come from outside the UK. The university’s research and teaching strengths derive in part from the geography of the region and include marine science, rural and sustainable development, environmental science and renewable energy. In addition, the university is active in the health sciences, business and management, creative industries, and in engineering, including aircraft engineering and energy engineering. 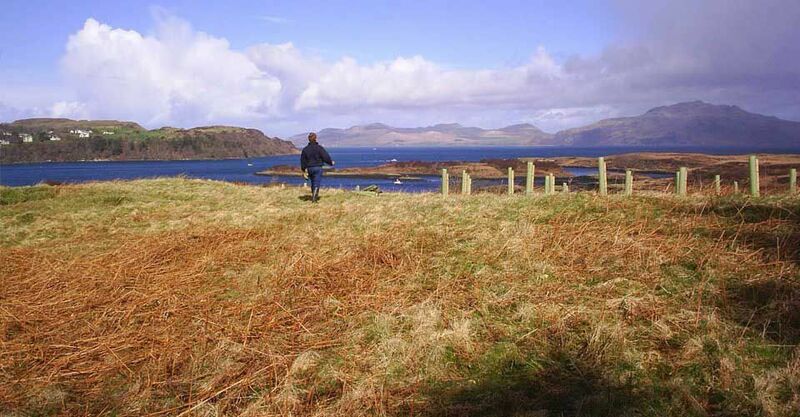 The UHI is the only university based in the scenically outstanding Highlands and Islands. It is internationally recognised for its innovative use of technology to provide access to higher education to a widely dispersed population. University of the West of Scotland is one of the country’s largest modern universities, with a broad range of vocational courses on offer. The University’s portfolio encompasses business, computing, creative industries, education, engineering, health, science, social sciences and sport. Many programmes are professionally recognised or accredited. The university has campuses across the west of Scotland including Ayr, Dumfries, Lanarkshire and Paisley as well as a campus in London and has a student population of more than 19,000 students. The UWS has around 3200 international students from countries such as the USA, India, Pakistan, Nigeria, China and across the EU. The university’s wide-ranging portfolio encompasses business, computing, engineering, health, science, sport, creative industries, education and social sciences. UWS also has a well-established track record in applied research and consultancy services to industry, with a particular focus on small-to-medium-sized enterprises. UWS’s ongoing developments to provide the best possible learning environments for students, saw its new £110m Lanarkshire Campus open in summer 2018. Its innovative learning suites provide hi-tech, flexible and collaborative spaces to deliver teaching and represent a shift in the way learning and teaching is delivered in Scotland and across the UK. One of the UK’s greenest education environments, the campus has windfarm-generated 100% renewable power and its own rainwater harvesting system.